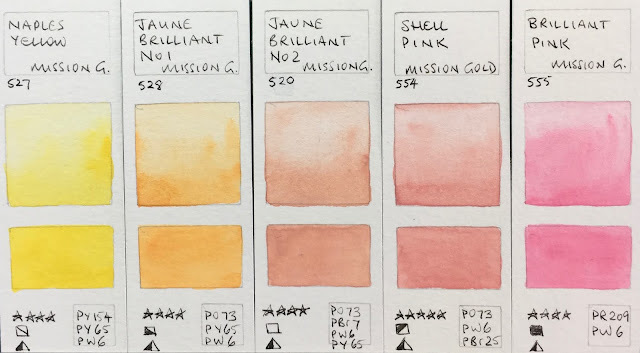 I had painted swatches of a few Mission Gold colours previously, is seen here, but have now had a chance to try the whole range. This is an interesting brand, made my Mijello of Korea. There are 105 colours but they are largely mixed hues created with very few pigments. There are no cadmiums or genuine ceruleans and the only genuine cobalt is Cobalt Blue. The paints are very predictable to work with, in the sense that they re-wet with the touch of a brush and brush out bright and strong, with very little granulation and very little drying shift. 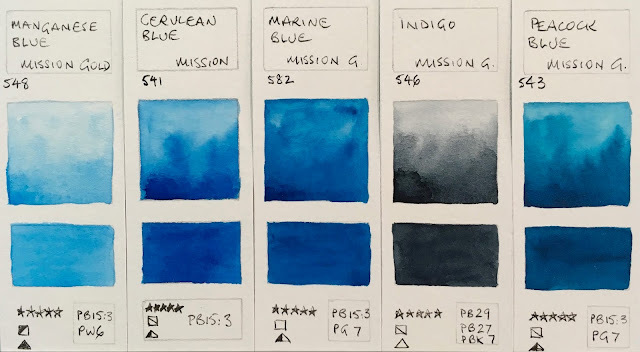 If you love bright colours and are starting out in watercolours, this could be an interesting range to try, though I certainly wouldn't recommend getting the full range, just the single pigment colours. Personally, I miss the granulation that I love as only a couple granulate at all. 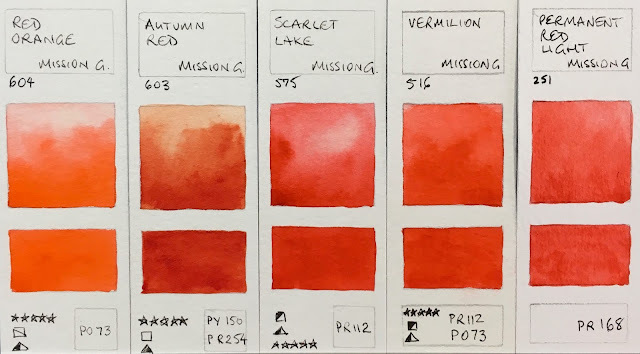 October 2018 - The swatches were originally painted out in a rather random order, but I have re-photographed them in a more useful order. I'll add them all to my website soon. Here is the full colour chart, with the meanings of the symbols. 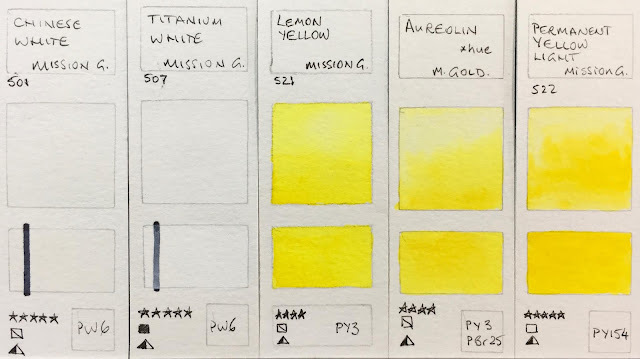 If choosing a limited palette of largely single pigment colours, Lemon Yellow or Permanent Yellow Light would be possible cool to mid choices. 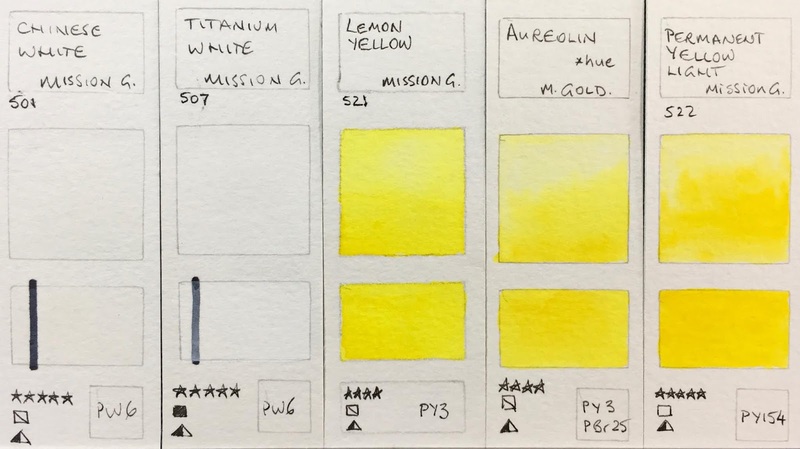 Mission Gold Watercolours by Mijello - Chinese White, Titanium White, Lemon Yellow, Aureolin, Permanent Yellow Light. I like PY65 as a warm yellow option. 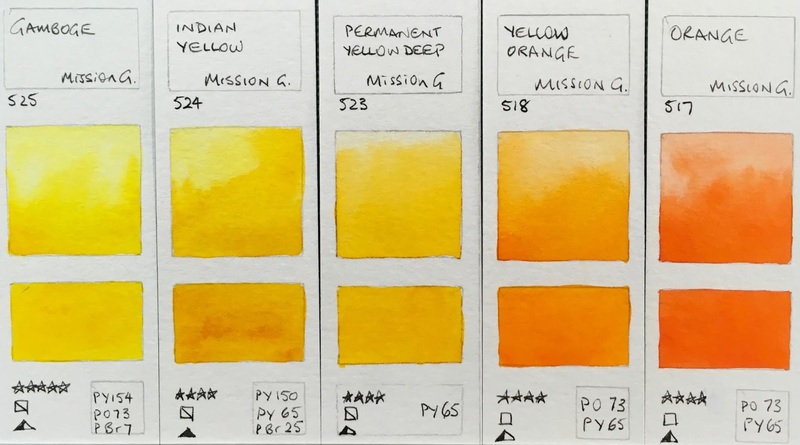 Mission Gold Watercolours by Mijello - Gamboge, Indian Yellow, Permanent Yellow Deep, Yellow Orange, Orange. Mission Gold Watercolours by Mijello - Red Orange, Autumn Red, Scarlet Lake, Vermilion, Permanent Red Light. Permanent Rose is an excellent pigment choice for a primary or cool red. Mission Gold Watercolours by Mijello - Perylene Maroon, Cherry Red, Permaent Rose, Compose Opera, Bright Opera. Most of the purples and violets contain PR122 so Permanent Magenta is a great mixing colour. Mission Gold Watercolours by Mijello - Bright Rose, Compose Rose, Permanent Magenta, Red Violet, Crimson Lake. Indanthrone Blue is a beautiful deep warm blue, however this sample didn't paint out very nicely. 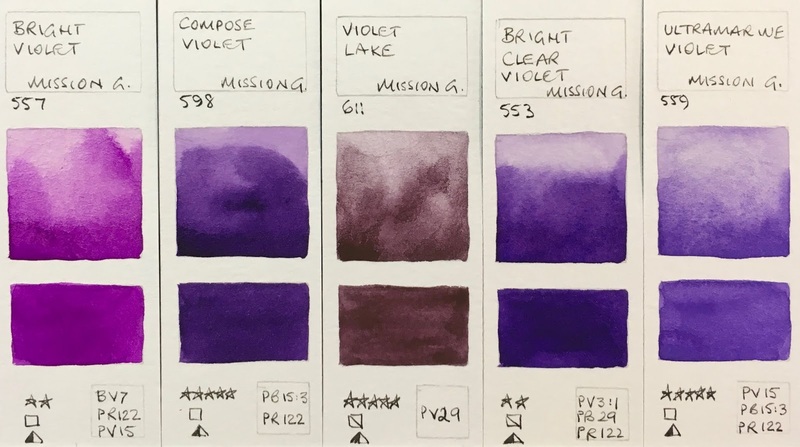 Mission Gold Watercolours by Mijello - Mijello Blue, Compose Violet Deep, Shadow Violet, Blue Violet, Indanthrone Blue. 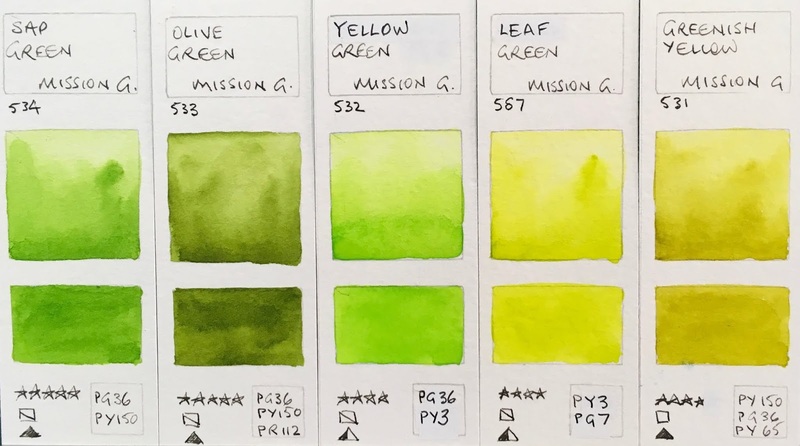 Mission Gold Watercolours by Mijello - Sap Green, Olive Green, Yellow Green, Leaf Green, Greenish Yellow. Yellow Ochre No 2 is the only single pigment earth yellow in this range. 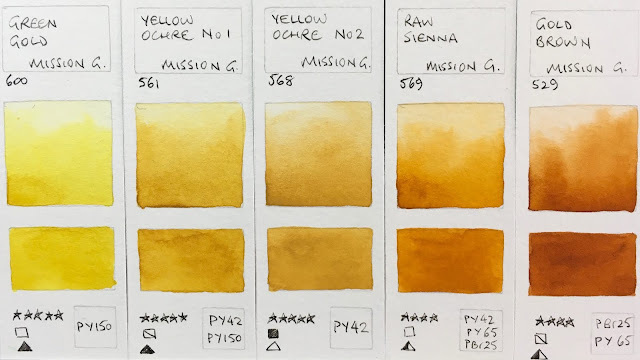 Mission Gold Watercolours by Mijello - Green Gold, Yellow Ochre No 1, Yellow Ochre No 2, Raw Sienna, Gold Brown. 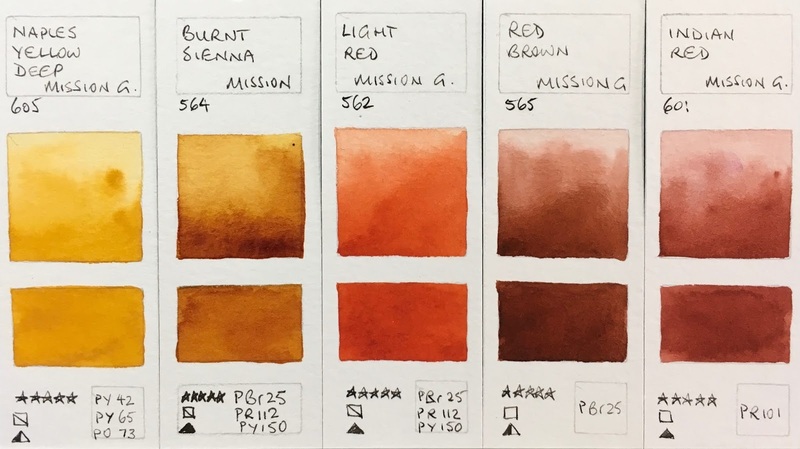 Burnt Sienna is a real problem in this range - it is more like a Quinacridone Gold hue and not useful to mix with ultramarine and other blues to create interesting greys as one would normally do. 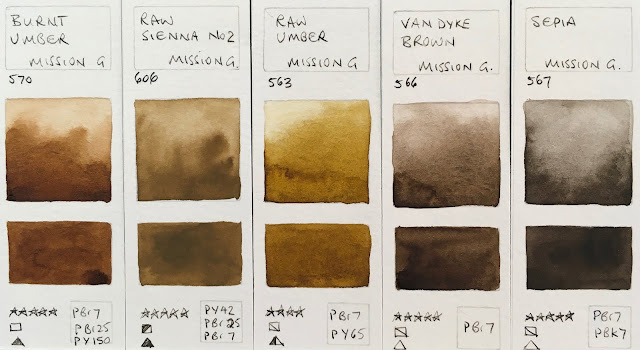 Red Brown PBr25 is used in a number of the Mission Gold mixes and is an interesting alternative to the more opaque Indian Red in the palette. 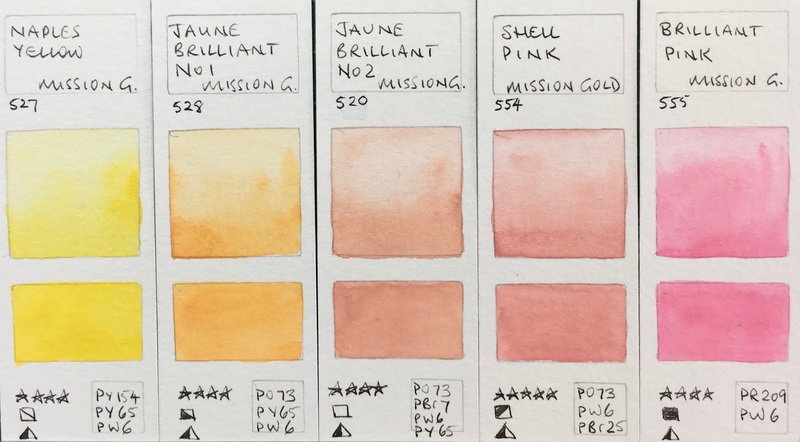 Mission Gold Watercolours by Mijello - Naples Yellow Deep, Burnt Sienna, Light Red, Red Brown, Indian Red. Van Dyke Brown is a good rich chocolate brown. 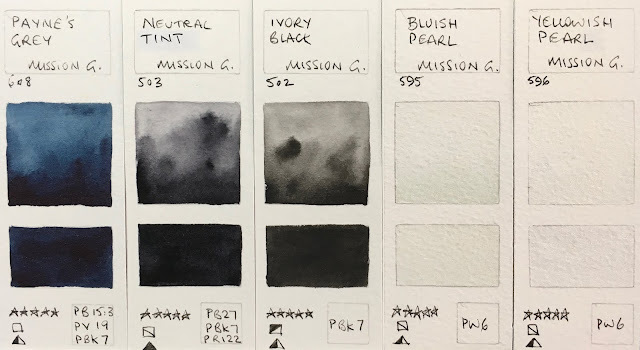 Mission Gold Watercolours by Mijello - Payne's Grey, Neutral Tint, Ivorry Black, Bluish Pearl, Yellowish Pearl. The tints - all these tints have some white in them and have a bit of a feeling of gouache. 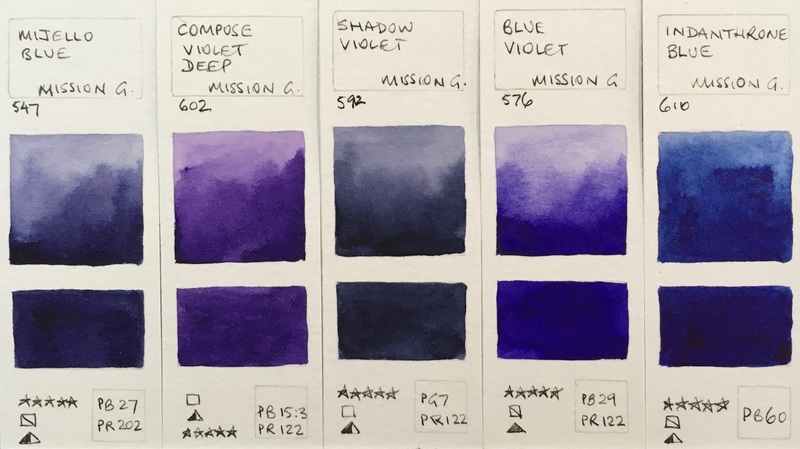 Mission Gold Watercolours by Mijello - Lilac, Violet Grey, Lavender, Verditer Blue, Blue Grey. 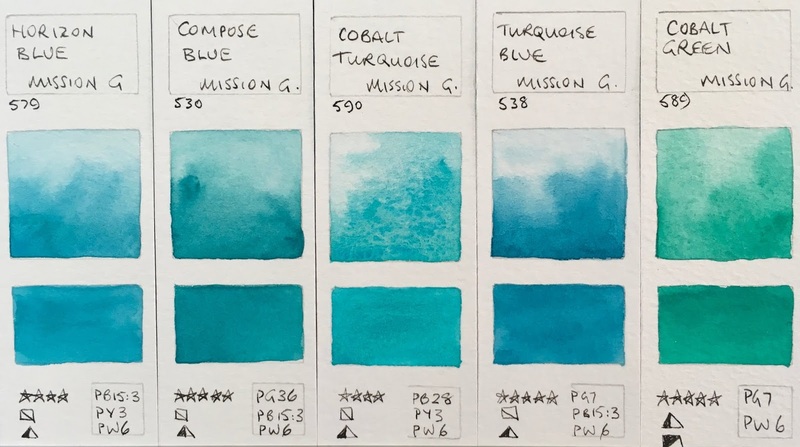 Mission Gold Watercolours by Mijello - Horizon Blue, Compose Blue, Cobalt Turquoise, Turquoise Blue, Cobalt Green. I enjoyed painting out these colours as they are very vibrant and 'well-behaved'. They disperse well in water and are easy to paint with, making them very consistent and predictable, as stated in the website. That will appeal to a lot of people. 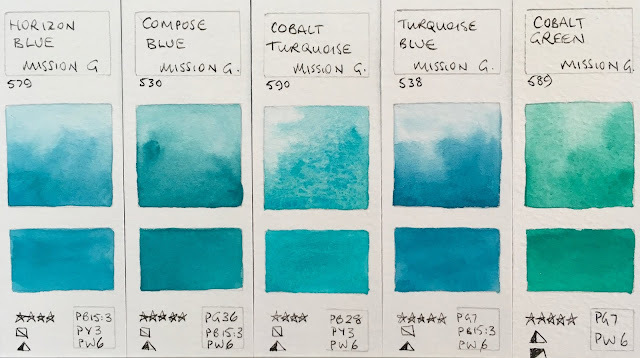 I admit they don't appeal to me - I enjoy playing with a whole range of characteristics in watercolour, not just the colour - but if colour alone is your goal, these are an excellent choice. The pigments have been improved since the range was first introduced and are now more light-fast. I think they would suit those wishing to work with a full gamut palette, as the range of earth colours is limited. If you wanted to create a basic set I would consider Green Gold PY150 or Lemon Yellow PY3 as your cool yellow, Permanent Yellow Deep as your warm and Yellow Ochre as your earth yellow. For reds look at Scarlet Lake for warm and Permanent Rose for cool (or Permanent Magenta PR122 if you love that pigment) I'd add Rose Madder for a crimson as well. For blues look at Cerulean Blue (hue) PB15:3 as a cool phthalo blue and Ultramarine Light PB29 as the warm. 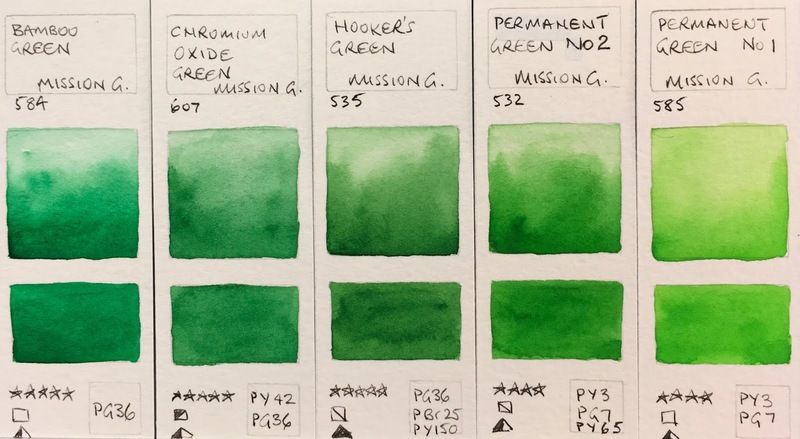 For greens, only to be used for mixing, I'd suggest Viridian (hue) PG7, which is phthalo green BS and neutralises a crimson, and/or Bamboo Green PG36, which is Phthalo Green YS, and neutralises PR122 and PV19. The earths are tricky, but I'd look at Yellow Ochre PY42 as mentioned, Red Brown PBr25 or Indian Red PR101 as an earth red. I'd probably add Van Dyke Brown as a deep brown and make my own custom version of a burnt sienna with the Yellow Ochre and Red Brown. I'm considering buying them now, since Amazon are holding a huge sale on them. 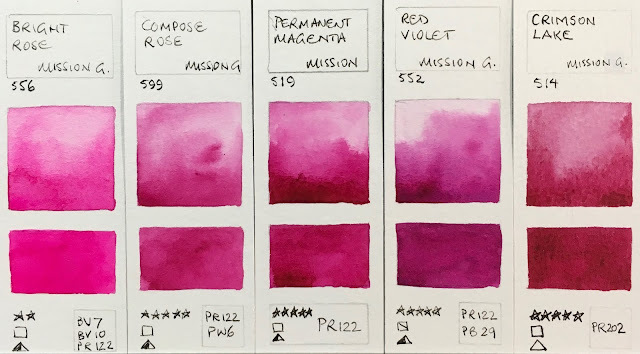 I'm deciding what's better - buy 4-5 Daniel Smith basic colors or buy set of 36 colors with nice palette included. For now I don't have any of these watercolors and have only pans set of White Nights. What will be your advice for a beginner? My paintings are listed in Instagram - Tanit555. I love your blog VERY-VERY much. Thank you! There is a sale for about $70+ for the 36 colour palette with 36 tube paints on Amazon listed here http://www.amazon.com/Mission-Gold-Water-Palette-Colors/dp/B00BFCGF2O/ref=sr_1_1?s=arts-crafts&ie=UTF8&qid=1461266659&sr=1-1&keywords=mijello - that seems like a pretty good deal to me, even if they are 7.5ml tubes (I can't find the tube size so I don't know). 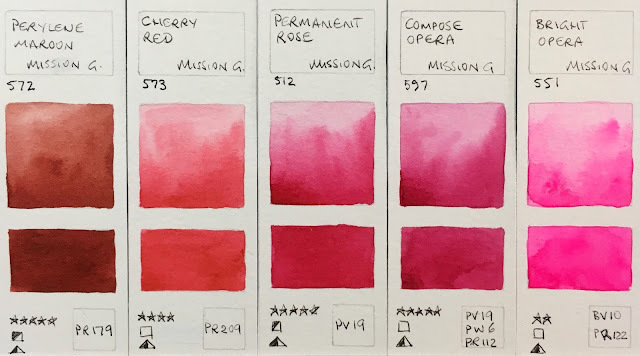 It will include more colours than you actually need, and perhaps not all of the single pigment colours that I recommend, but you'll be able to do a lot of painting with them, and you'll be delighted with how easily they rewet and how easy they are to paint with, as well as how bright they are. They won't completely solve the earth issue you will already have with White Nights so one day you may just add some excellent earth colours or granulating colours from Daniel Smith. I like Mission Gold. I bought the 9 tubes set and was impressed by the intensity of the colours. It's a good set for beginners who want to try this brand. I agree they are a very good beginner set and the intensity is striking. They are also good for those who don't like granulation! I´m with G.M. since 3 years back and go along with your experience . Sepia is a very useful a hue ,too Pbr9,Pbk7 . And what i found out ivory black has to be in the palette , why , well the idea from mijello do darken down with less color shifting. May i can add something about long term fading . Most of the heavy chalked white Hues will strong fade after 2 year. 95% may Watercolors , are painted with Mijello G.M. Love bright colors and have fun , start with Mijello. Ps. : Mijello has Student range , too . Hello! First of all, thank you for this excessive review, it is very helpful. Since I'm just starting out I can't buy really expensive paints, and a nail art shop sells the 25 ml tubes for less than 2 dollars, so I decided to build up my starter palette with these. I went and bought a few tubes today, one of them is Burnt Sienna, and unlike yours mine says it is a single pigment paint, using PR101 pigment. I bought the Ultramarine Deep too and even thought it's not a single pigment paint, the two of them makes a great grey. Do you think it's possible mine is reformulated? Also, I was wondering if you'd like to get a sample from it to test it. Great to know they have reformulated the Burnt Sienna. I think they have been very actively improving the range and will watch this company with interest. Hi Jane, very insightful as usual. Yes, their colours are more suited to illustrations, i think. For granulations i prefer Kremer. By the way, i have their perfect pan set of the Mission Gold, and i find that the colours don't really set, much like White Nights. So i use them only for paintings in the studio. Can you explain how the colours don't really set? I just ordered the White Nights & now I feel apprehensive ... I forewent Mission Gold b/c I wanted the whole watercolor experience, not just a color mixing experience. I have seen that Mijello has several new pigment colors. short question: do you find the Pure Pigment set meaningfully put together? Thank you for the link - looks as though I'll need to update! (I was planning to rephotograph them in better order - I'll look for the missing new colours and add a blank swatch). 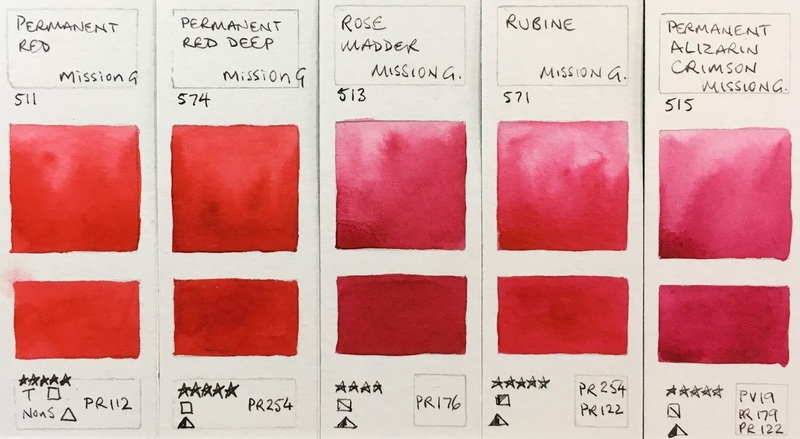 The Pure Pigment set is a pretty good single pigment set of colours. 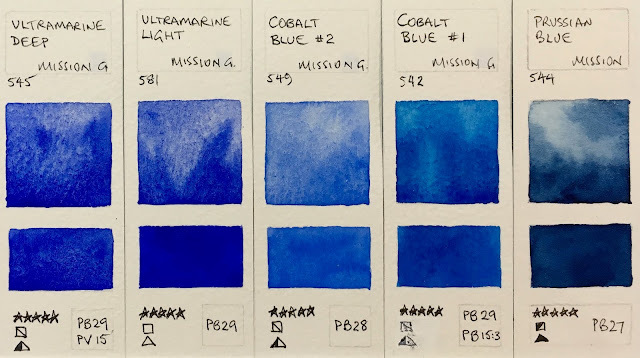 I don't like the Cerulean blue (since it is a phthalo blue) or Burnt Sienna #2 particularly, but nor did I like their original burnt Sienna. Otherwise though, good pigments to work with. Hi Jane, great that you want to expand the color card. I came across the Pure Pigments set because some of my most used colors are almost empty, and it is cheaper to buy a set. the old set had 9 red tones. I also noticed that with the Creulean blue and the brown shades I find a bit strange. Unfortunately, the Indian red is no longer in it. I think it is still the best of the finished sets with 24 colors, black and white. For other sets, there are often colors of several pigments, a few non-lightfast or colors that I do not need. Too bad that there are so few tube sets. 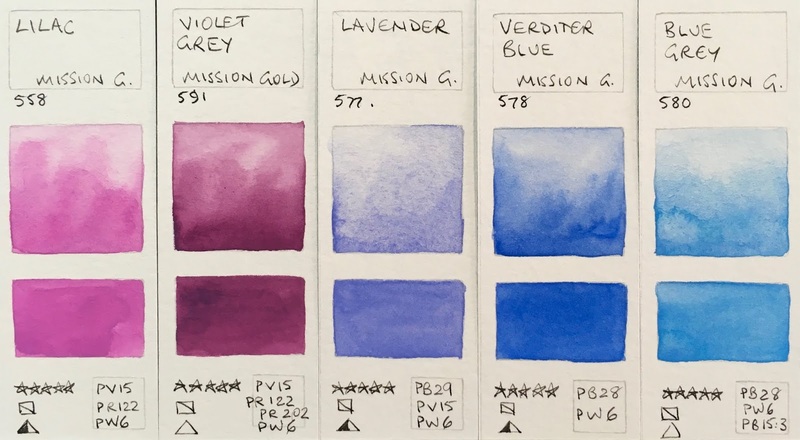 I have tested a few Kremer and Rublev pigments, amounts others, that have been hand made into watercolours but I doubt very much that I'll try the whole range.I depend on other people generously sending me samples to test those. I'll be adding a blog about them soon though. There are dozens to photograph! I have the set of nine. I am sure I have read somewhere they can be used as gouache, especially if adding Titanium White. Would this work with the Chinese White I bought separately? While I live the vibrant colours, I have decided not to add to my collection due to the sticky lumpiness. I do want to use them however, and wondered if I could use them on one of the typical printed gesso canvasses? They were a gift off a dear friend and not exactly cheap; so I do want to use them up in a suitable way. very nice post of gold set, amazing collection.